I became a FOX Sports Midwest Girl during a contest to replace the fabulous Aimee after she announced she was moving on in her position with YELP! I submitted a video audition, rallied for fan votes and underwent an interview process to join Kayla in St. Louis. Coming from a small town in the greater St. Louis area, I experienced an overwhelming amount of community support in the process and cannot thank people enough for voting for me. As a HUGE St. Louis sports fan and someone with aspirations in this industry, the process was humbling and nerve wracking, as I desired the position with all my heart. I am so grateful to have won. 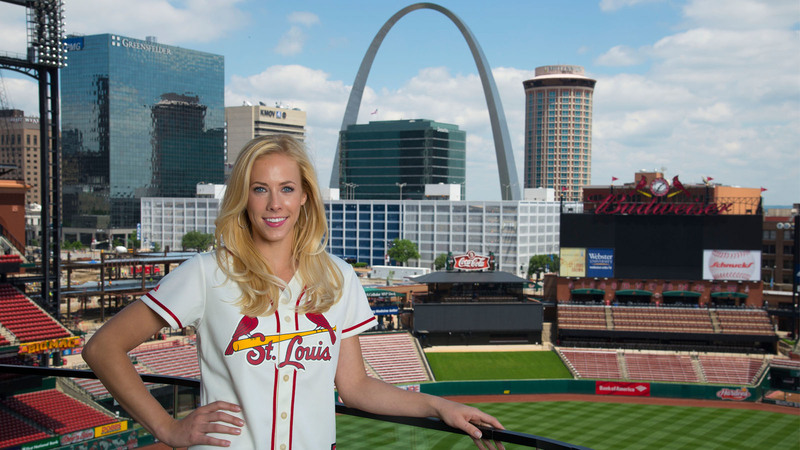 Of course all the amazing trips, including the fabulous FOX Sports 1 launch road trip, and sporting events have been a dream, but moving to the root of what sports are all about and the idea of athletes and organizations giving back has been such a fulfilling aspect of being a FOX Sports Midwest Girl. One of my favorite appearances was a visit to my former junior high to meet with their Girls on the Run team. We do work with GOTR in the area and it was great to be able to see first-hand how their great efforts help girls in my hometown and community. I was blown away by the things they do for young girls, including teaching them about life, love, friendship and self-worth, all wrapped around the idea of a healthy lifestyle — something that I connect with on a personal level. My greatest sports memory by far is when Mizzou upset No. 1- ranked Oklahoma at Faurot Field. The atmosphere was just electric; the entire stadium rushed the field and carried the goal posts into downtown Columbia. Of course you have to go to a Cardinals baseball game at Busch Stadium. Nothing says St. Louis like Cardinals baseball! While you are there, take a walk across the street to the new Ballpark Village St. Louis — that is a sports fan’s paradise. If you are lucky enough to be there when sports seasons overlap and you can get out to a Blues game you must go! You have never truly experienced the sport of hockey unless you have seen a game in person. My family has passed on their passion for sports on to me. My mother and father were both athletes back in their day and passed on their love for playing sports on to my brother and me. In turn, I always have the desire to get moving and stay active through sports. My father coached me in several sports growing up and taught me how to play golf, while my mother was there for me during my gymnastics career. Both have always been my support system for all the sports I played. In addition, sports have always been on TV in my household and we have gone to hundreds of sporting events over the years. I don’t know what else we would do together, sports are who we are! Team leader. I love to strive for the best and push others around me to be the best they can be. I cheer on my teammates, am their therapist when they are down, and will take one for the team when needed. As stated before, I really enjoy working with Girls on the Run St. Louis. The organization strives to teach girls to become strong women and lead a healthy life — two missions close to my heart. I also enjoy all of the work we are able to do in support of the troops, whether it’s a trip to a military base, work with Mission Continues or a "This One’s For You" night at the ballpark, giving back to those that sacrifice for our country is very important. My grandpa enlisted in the Military and I have friends that currently serve. Most recently, my best friend’s brother deployed to the Middle East for the third time. Although he is now home and safe with his new baby girl, who was born while he was away, through my friend, I have seen first-hand the sacrifice that the families also make while their loved one serves. I can’t really remember the first game I ever attended. I have been going to sporting events all of my life, so it’s just been a pastime of mine. One of my favorite people to follow on social media is FOX Sports Midwest’s Jim Hayes. The Cat always has something funny to say, while keeping us informed on everything St. Louis sports. He also does a great job of taking people behind the scenes of his job and the fans love it. Oh I will definitely have stints of superstitions. If I think my team is doing bad by me either watching or not watching a game I will stay or leave the room. I also feel the need to cheer them on Twitter if they need a pick-me-up or an important play — as if they can hear me over Twitter while they are playing haha. Youth: (organized) gymnastics, softball, volleyball, basketball and golf, as well as, anything I could do in the yard/driveway: wiffle ball, hockey, kick ball, etc. Aside from Cards/Cubs and Duke/North Carolina, my favorite rivalry is Mizzou/KU. The passion, hatred and competitiveness is hard to explain unless you are one of us. Even though the Tigers are no longer in the Big 12 my rivalry with KU has not faded. Chili cheese dip is my jam. The secret to this traditional Velveeta and Rotel dip is to use sausage instead of hamburger — it adds more flavor and spice (in addition to the chili powder and worcester sauce). I am craving it just thinking about it! I also always bring a jar of my homemade salsa made with love and my homegrown tomatoes to a watch party. -Rodeo (check) but the Cheyenne Frontier Days Rodeo and barrel races would definitely one-up that. I love Happy Gilmore and Caddyshack. Classics! I always had to wear the lowest number because I was always the smallest person on the team and, therefore, had to wear the smallest jersey they had. Thank goodness I eventually hit a growth spurt! I have always liked the No. 23 for Michael Jordan, 25 for Mark McGwire when I was a kid and 19 for my birthday. AC/DC’s "Back in Black": I don’t know what it is about that song but it always gets me pumped. I think it would give me a little swagger walking up to the plate. For me its the Cardinal greats like Stan the Man, Lou Brock, Bob Gibson, Jim Edmonds, Ozzie Smith, Willie McGee, Tony La Russa, Yadier Molina, etc. I will also have to put Albert Pujols in the same conversation for all that he did here in St. Louis. But I also think of Kurt Warner, Marshall Faulk, Issac Bruce and the "Greatest Show on Turf", along with Brett Hull and Bernie Federko for the Blues.